The Toronto Design Offsite Festival is partnering with the Gladstone Hotel to offer Festival attendees discounted rates at the boutique hotel! #TODO17 visitors receive 15% off Standard Global Rate with the promo code TODO2017 when booking a stay online, on the phone (416-531-4635), or via email to [email protected] (offer valid only on rooms booked between January 14 – 23, 2017). 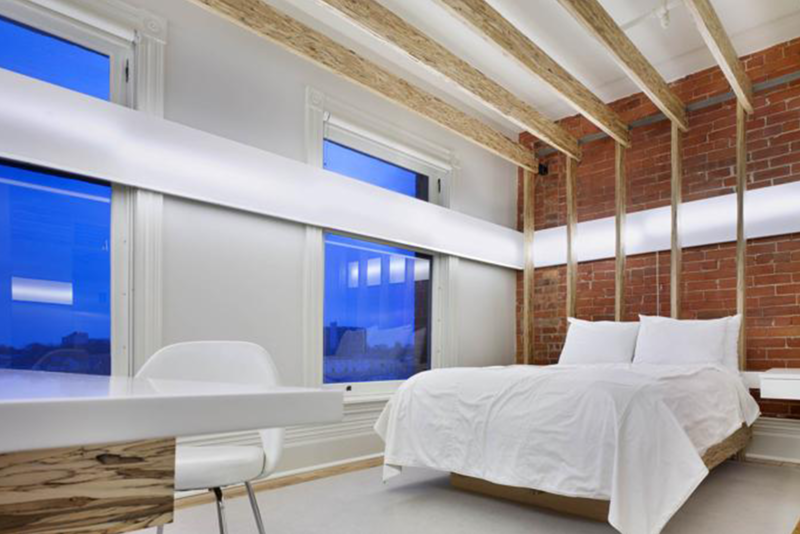 The Gladstone Hotel is Toronto’s boutique art hotel, located in the city’s art and design district. Choose from 37 unique, artist-designed rooms, and enjoy exhibition programming 365 days a year, locally sourced food, as well as some of the best wild parties, live music and cultural events in the city—all under one roof! Attendees who stay at the Gladstone Hotel will have access to our Festival programming just a few steps from their hotel room door! TO DO’s signature exhibition, and annual show-stopper, ‘Outside the Box’ will be on display at the Gladstone Hotel Art Hut. The third annual travelling exhibition features the work of over 70 designers from 12 cities across Canada and the U.S. Curated by local correspondents, each Bankers box houses a collection of thoughtfully designed objects, reflecting the particular resources and makers of that area. ‘Come Up To My Room’ will be exhibiting at the Gladstone Hotel during #TODO17, featuring the work of over 20 artists and designers whose ideas and concepts collide with objects and space resulting in the physical manifestation of unique interpretations of the notion of transplantation. The annual immersive exhibition uses the hotel walls as a blank canvas to explore new themes and ways of working. The Gladstone Hotel will also be hosting the Love Design Party, the official wrap party for our 2017 Festival season. (Just one more reason you should book a room at the hotel. Because…well, it’s going to be a late night). Whether you’re booking a vacation or a staycation, make the Gladstone Hotel your home base for #TODO17. Visit the Gladstone Hotel’s website for more information!